I hope you have a waffle-icious day. The CowChows was on the road this weekend. We had a most excellent time at the Grand Master's Chance-to-Advance in Columbia, MO. Approximately forty of our Brethren were raised to the sublime degree of Master Mason, and about twice that number were there to assist. The Degrees went well and Masonic knowledge and education was freely given and gained. The Lady BG and I stayed overnight because, well because I'm old and she was tired. The hotel offered a decent little buffet-style breakfast, and we decided to partake before starting for home. Among the several breakfast foods available was waffles made on one of those do-it-yourself automatic waffle machines. It's a pretty interesting contraption. You fill a small cup, about two and half ounces, with batter and pour it onto this waffle iron, flip it over, and when the beeper goes off your waffle is done. I had just flipped mine over and was waiting for the beeper when a young boy appeared at my elbow. He was shoving a coffee mug under the batter spout. Eventually, and with practically no help from me, he figured out how to start the batter flowing. I watched as the batter flowed, and flowed, and flowed into the mug. I started to suggest he use one of the small cups but he seemed to know what he was doing and I didn't want to be a buttinsky. Finally, the mug was nearly full of batter and he stepped over and began pouring it onto the waffle iron. I watched because I thought I might learn something about this newfangled machine. Very carefully, he poured batter all over the iron until it began running over the edge, and then he poured some more. Then, he slammed it shut and flipped it over. There was batter dripping from the iron but, all in all it seemed like a pretty smooth execution so I finished up with my measly little waffle and went back to the table. Less than a minute later I nearly choked on a waffle bite and fell off my chair when the shrill scream of the smoke alarm pierced the air. 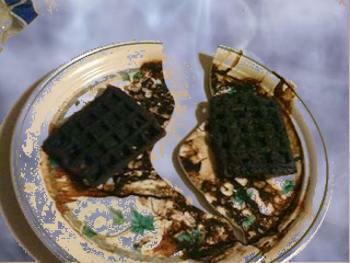 I turned to see white smoke billowing from the waffle iron; the little boy was heroically trying to rescue his waffle; the boy's dad jumped to his feet and plunged into the smoke to rescue his son; the boy was asking, "Is it sposed to do that, daddy? "; the boy's mom was screaming, "I thought you were watching him! "; Daddy yelled, "I was watching your daughter. I thought you were watching him! "; "I was getting a plate for your daughter! Why weren't you watching him? "; by now their daughter and every other kid in the room was crying; the chef threw his arms in the air, screamed "FIRE!" and ran into the kitchen; there was a loud crash and the chef did not return; the desk clerk came running from the far side of the lobby carrying a fire extinguisher, and yelling, "Call 9-1-1! Call 9-1-1!" as he disappeared into the smoke. Turned out it was all smoke and no fire. No one was hurt, except maybe the chef. And, I learned a valuable lesson. Don't take cooking lessons from an eight year old, and being considered a buttinsky is not the worst that can happen. The date for the 1st Annual Solomon Lodge Golf Scramble has been changed. The new date is July 30, 2010. The four person scramble will still be held at the Deer Lake Golf and Country Club and will begin at 1:00 PM. The old registration form will still work and can be downloaded by clicking here. The Masonic Education Study Group will meet on Tuesday May 25 @ 7:00 PM at the Scottish Rite Cathedral, 505 Byers in Joplin. A two part discussion will be held this time. The first half will be a discussion on AF & AM and F & AM. The second half will be the history of the Grand Lodge of Missouri. This discussion will be moderated by RWB Matt Ruth, DDGL of the 46th Masonic District. Due to the nature of these topics Entered Apprentices and Fellow Crafts are invited and encouraged to attend. This Masonic study group meets every other fourth Tuesday at varying locations. Perhaps your Lodge would like to host a meeting.